Enlace recently received a substantial grant from The Harry and Jeanette Weinberg Foundation, Inc., to support construction of a new 9,000 sq. ft. office and community space in Little Village, ensuring completion of the project. 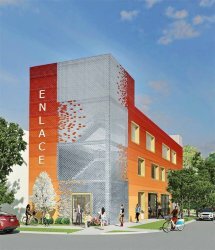 The new building will allow Enlace to better provide comprehensive services in the areas of education, health, immigration/legal aid, and violence prevention. The three-story building will have a spacious welcome center, multi-purpose community rooms, several one-on-one counseling rooms, a rooftop garden, and efficient workspaces for Enlace’s growing staff. “Our new building will help us work more efficiently and will serve as a ‘one-stop-shop’ for Little Village community members seeking services and opportunities,” says Katya Nuques, Enlace’s executive director. In 2014, Enlace received a $2 million capital grant from the Department of Commerce and Economy Opportunity (DCEO) for the project. In June 2015, Enlace received a letter stating that the grant was not re-appropriated and funds were frozen due to the budget impasse. In collaboration with other agencies whose capital funds had also been frozen, Enlace worked to obtain permission to spend the first DCEO grant installment. In May, Enlace received a letter stating that it would be allowed to spend 25 percent of the total funds. Enlace was not able to delay construction any longer in anticipation of the remaining funds, as it was responsible to the expectations of DCEO and other funders. With support from IFF, it completed a second financial feasibility study that included an ideal construction plan and budget, as well as an alternate plan and budget that would satisfy the short timelines set forth by DCEO and other project supporters by allowing Enlace to move forward without the additional state funding. In 2001, Enlace purchased its current main office, which was appropriate for what was at that time a staff of five. The building continues to serve as Enlace’s main office even though staff size has grown to 40 full-time and well-over 100 part-time. Enlace programming is severely restricted by lack of adequate space. For example, Enlace organizes community-based workshops and provides free legal services through a partnership with the Community Activism Law Alliance (CALA) in order to support residents with cases related to a range of issues, including immigration, family law, employment and housing. Enlace serves over 8,000 Little Village residents through its two offices, eight local school partnerships and other collaborative arrangements that provide space for programming and services. 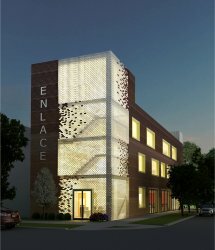 In its first year, this new facility alone will allow Enlace to serve more than 3,000 additional residents.